If you have requirements of cleaning and descaling of symmetrical parts and components then Table type shot blasting machine is the best for the task. It has a turntable which is the main component of the machine for handling workpieces. In case you have asymmetrical components that require blasting then the turntable can be adjusted at different angles alongside multiple positioned blast wheels. 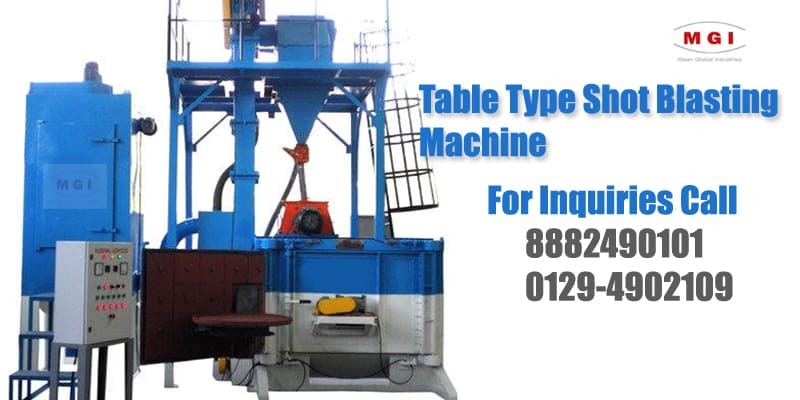 Maan Global Industries is the leading manufacturer of Table type shot blasting machine in India. We have been manufacturing various types of shot blasting machines in India as per the requirements of our customs and delivering the machines to the diverse industries ranging from Casting, Forgings to the aluminum castings industry. In additional to the generic Table type shot blasting machines which have one or two turntables we also provide machines with mobile turntables that reduce the processing time by allowing loading new components while others are being processed. With a combined experience of over 2 decades we have delivered shot blasting machines in India and overseas to the customers for descaling and cleaning purposes for the components weighing upto 10 tons. Our Swing Table type shot blasting Machine is designed keeping in mind the both efficiency and optimized cleaning of the heat treated components as well as castings and forgings. It offers complete flexibility with a single door and double door option. As a leading Swing table type shot blasting machine manufacturer in India our machines are a preferred choice for removing after scales from the heat treated components and surface preparation for the rubberizing and powder coating industry. Swing table type shot blasting machine are known to optimize the blasting operation while keeping your costs low. It can be a wise investment as our machines are manufactured in India using the highest quality of materials and components and every machine goes through a 3 step quality check process. Looking for Table Type Shot Blasting Machines?